This hillside site which contains a natural spring and river will be used to create an exclusive new experience for a Bali villa spa resort. The design of the resort offers laid back living in harmony with the environment. Luxurious comfort is enhanced by a sense of direct contact with the elements, as hillside breezes and light waft through to spaces that caters to both outdoor living and secluded relaxation. Inspired by its natural setting, the scheme draws on glowing jewel colors and earth tones, natural textures and ornamentation to create richly unique buildings that capture a unique sense of place. 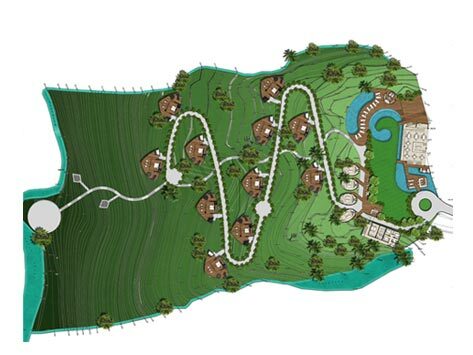 These buildings include 2 bedroom villas, receptions, restaurant, treatment suites, yoga pavilion and an amphitheater. Buildings use interesting forms to both further the brand identity of the resort and provide an appealing setting to reside in. 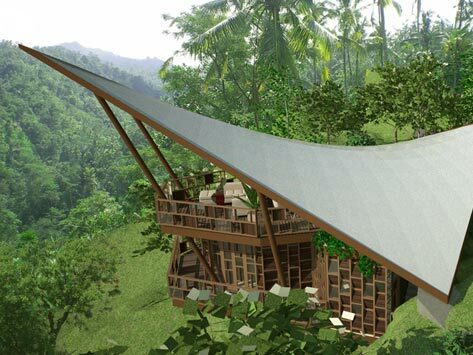 The resort will also feature a range of environmentally responsible features such as sustainable materials, organic permaculture and a hydroelectric generator.